just accept that Garmin programs for Mac OSx are lousy - (well the whole OS is as lousy as Windows, but with fewer people using it, I wont give a damn for it - best treat your Mac hardware with a good OS like Ubuntu Linux instead of junk with nice eye candy). However Qlandkarte GT is working splendidly with the openmtbmaps, and is easy to learn. Only drawback is, that there is no autorouting support for garmin maps (yet). You only need to extract the maps to a folder of your choice then use Qlandkarte GT. The irony of Basecamp for MacOSx not reading in the standard .img format, is topped up, by the fact that it reads the nearly identically structured gmapsupp.img files. So use Windows Basecamp/Mapsource or gmaptool or mkgmap or sendmap to create a gmapsupp.img - put it on a external harddisk or flash memory (you could also put it onto your GPS, but than it's slower) and import it into Basecamp. This way you also don't have to actually convert the maps. You could also install Qlandkarte GT - you will have to compile it first though. Builds are only available for Windows (plus easy installation on Ubuntu - but probably added into repos soon anyhow). BTW: As all my maps are published under CCBYSA 2.0 / The new Openstreetmap Licence - you may share your mac map files freely - as long as you contribute openstreetmap.org and openmtbmap.org and stick to the same license. Unfortunately you need an windows installation for converting the maps to "Mapsource for Mac" aka Roadtrip. You could also install Qlandkarte GT - you will have to compile it first though. Builds are only available for Windows (plus easy installation on Ubuntu - but probabley added into repos soon anyhow). 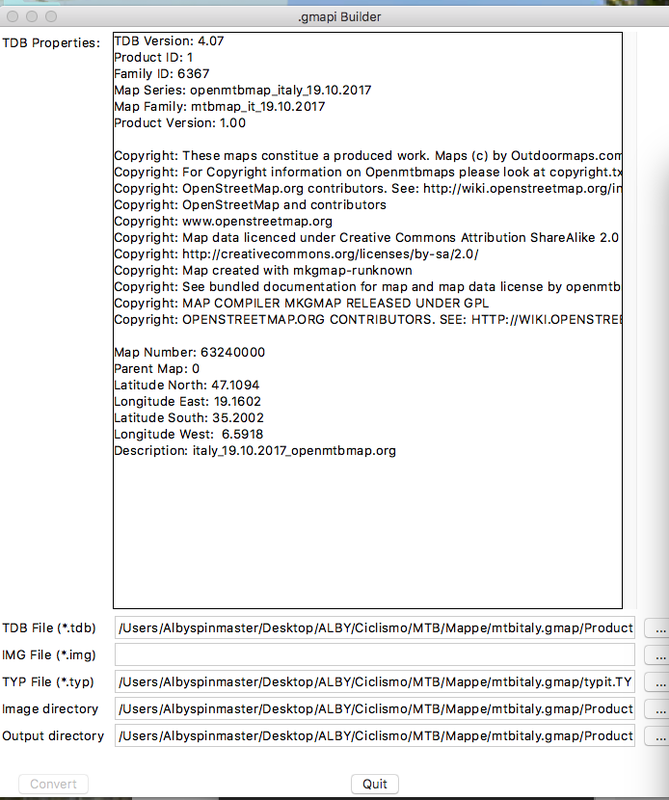 BTW: As all my maps are published under CCBYSA 2.0 / The new Openstreetmap Licence - you may share your mac map files freely - as long as you contribute openstreetmap.org and openmtbmap.org and stick to the same license. 1. Download the velomap or openmtb map of your choice. 2. Extract the .exe file using Keka or Archiver. You will end up with a couple of subdirectories. The one you are interested in contains the .tdb and .bat files etc. If you're installing velomap Europe, extract the map tiles to the same directory as the .tdb file. 3. Open Gmapi builder application. In the main window, click the ellipsis (…) button next to the 'TDB File' field. Navigate to the folder where you extracted your map, and select the 'mapset.tdb' file, and click OK.
4. You will notice that all of the other fields in Gmapi Builder auto-populate, EXCEPT the 'TYP file' field. Click the ellipsis button next to that field, and select the .typ file you are using (trdxyz.typ, veloxyp.typ, etc.). 5. Click the 'Convert' button, and wait until the conversion finishes. By default, the .gmapi file will be created in the directory where the .tdb file is, but you can set it to go wherever you like using the 'Output directory' field. 6. You now have a gmapi file that Basecamp can read. Open Garmin MapManager and select File --> Install Map (⌘–I), navigate to the newly created .gmapi file and click 'Open' to start the installation. 7. Your map will be installed for Basecamp. You can copy it to your GPS unit or SD card using MapInstall. Be aware that MapInstall WILL OVERWRITE the gmapsupp.img file on your GPS unit, so rename it first if you want to keep it. If you're installing the velomap for all of Europe, make sure you extract the contents of the veloeurope.exe file (i.e. mapset.tdb, etc.) and the contents of veloeurope.7z TO THE SAME DIRECTORY. You want all the image files (xyz.img) and the other files in the same folder. If you don't want to use MapManager for step 7, you can try to skip it and open the map directly from Basecamp. That seems to be unreliable in the current version—sometimes the map gets installed, sometimes nothing happens. In any case, the gmapi files are installed into the directory ~/Library/Application Support/Garmin/Maps/. (that’s the reason this topic is archived. The conversion was needed before I offered the OSx files directly for download). ho scaricato le mappe open mtb per italy e europa. 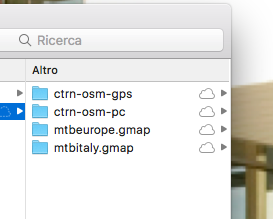 Non rosico a convertirle con map builder, in quanto, nella cartella creata dopo la decompressione dell’archivio, non e presente nessun file con estensione dmg. come posso risolvere il problema? Any know how to do this on a Mac? The .gmap are already converted. Nothing more to do for you! This instruction was for converting the .exe downloads to .gmap.